Content warning: this game is a bit spooky and involves audio referencing mental health. This is a game about a fleeing exile. A alien. The game only has one level, and the objective is to reach the exit. I use some sound effects from FreeSound, like the sound of alien. Using Google and a tool called Metaphor Magnet, I discovered that people feel terrified by alien sometimes. So I chose a eerie piece of music from Kevin Macleod's Incompetech website to complement the game's mood. 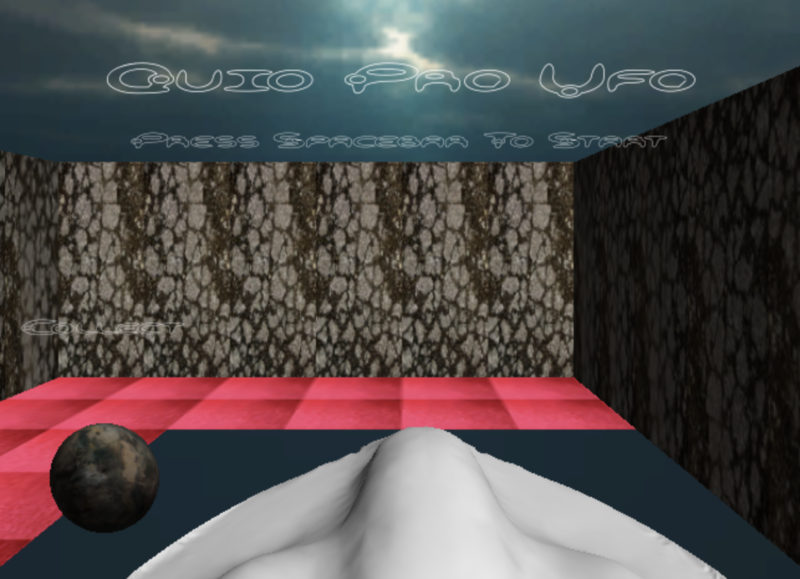 Quid Pro UFO is a game designed by ANGELINA, an artificially intelligent piece of software designed by me, Michael Cook, an AI and Computational Creativity researcher. Quid Pro UFO was developed by ANGELINA while I was working on the system towards the end of my PhD. This era of the software didn't produce very good games, but it did double down on theme, and this game has quite a good one - tense music, weird alien/space vibes, and some unsettling sound effects. It pulls together into quite a good package, even if the game itself is a fairly simple 'maze'.